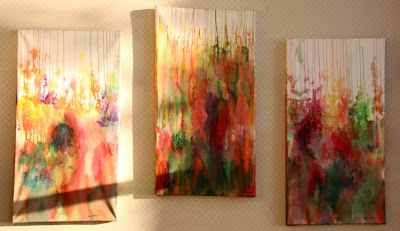 Running up is a triptych done using fluid acrylic on a gallery wrapped paper surface. A triptych is a type of polyptych, the term for all multi-panel works of art; in this case a piece of art composed of three panels. You can see the color scheme used for this triptych is similar to the color scheme used for my Rhythm abstract discussed in my November 15th blog post. 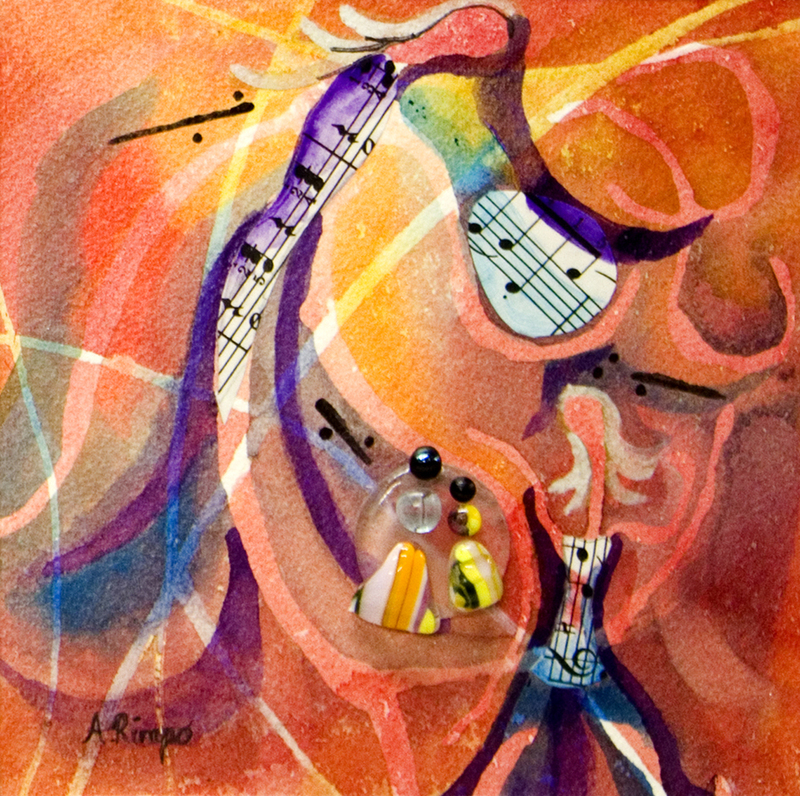 The same complementary triad color scheme of orange, green, and purple was used since these paintings are in the same home as Rhythm. This was my first time creating gallery wrapped paper surfaces. 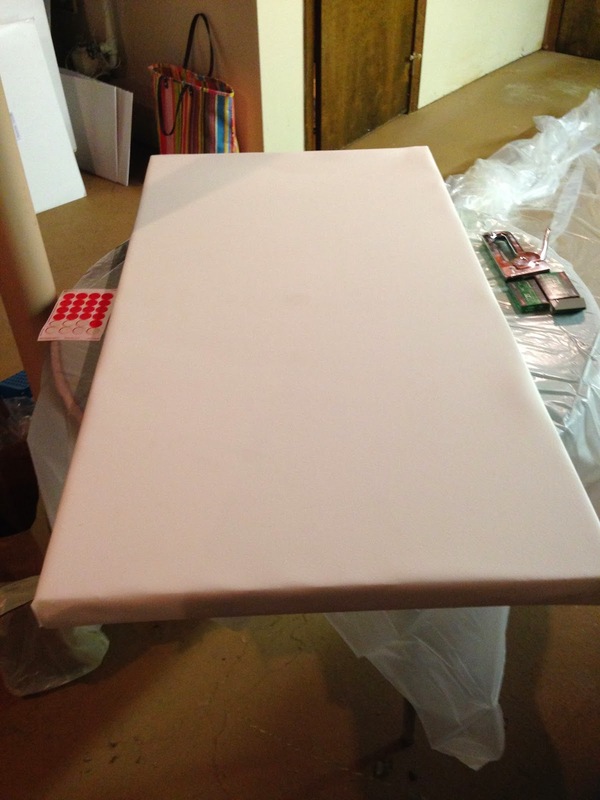 I used 1.5" deep stretcher bars that measure 45" X 24" that were varnished with Liquitex Satin Varnish. UPDATE: As time has passed I have learned that starting with one or two coats of gloss varnish give the finished piece a nice sheen. There are two reasons for this: the glossy finish is more reflective, but more importantly if you use more than two coats of satin or mat varnish the varnish can become cloudy. 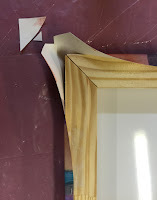 UPDATE: I have found using foam core and gallery wrapping has worked wonderfully for small paintings, but larger pieces can sometimes have problems with rippling in the corners after varnishing. For those I have started to attach the paper to Alumalite (a corrugated plastic board with a thin aluminum surface on both sides) using Acrylic Medium Gel. Since the paper is essentially glued to the board there will be no buckling. 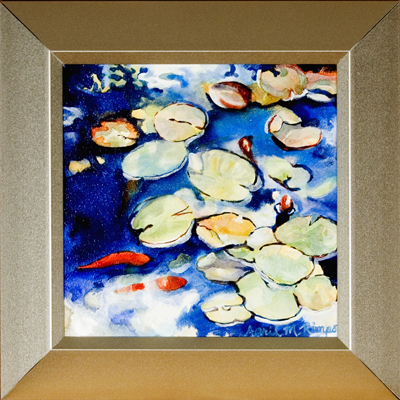 These can be framed watercolor or fluid acrylic pieces that are mounted, varnished and displayed without glazing. 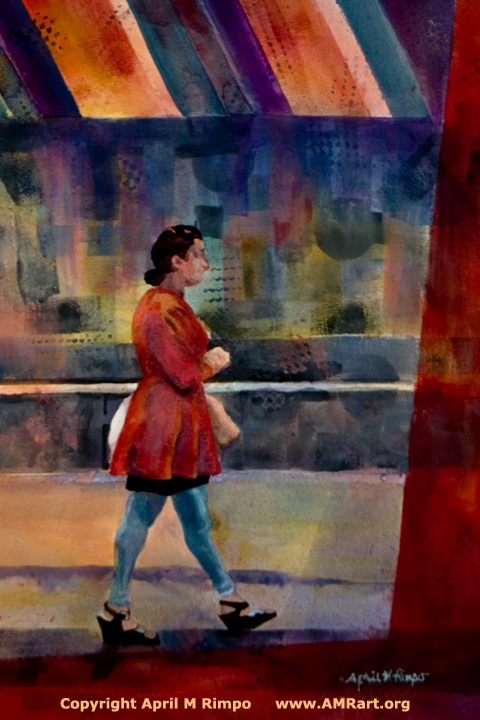 Those who know David Daniels' watercolors will be familiar with this approach. 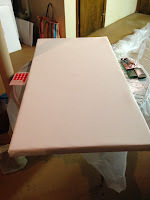 Unlike David, I often gallery wrap the paper around stretcher bars and paint around the edges so no frame is required. To create the abstracts shown above, I placed a small amount of each fluid acrylic color in a small measuring cup, added some water to dilute the paint sufficiently for it to flow over the paper, while still being an intense color. The colors were allowed to mix on the paper as I painted. Only a few colors were premixed on a palette before applying to the paper. 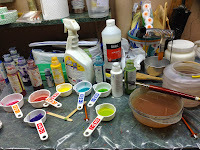 The spray bottle shown in the picture at right contains water, which was sprayed on the paper prior to applying paint to encourage the paint to run and flow freely. 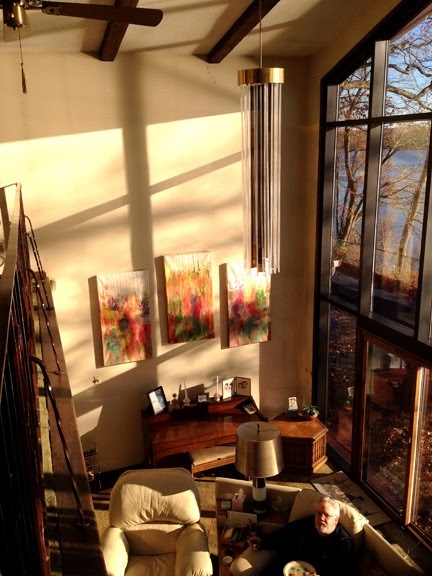 Below you can see the finished painting installed in its new home. 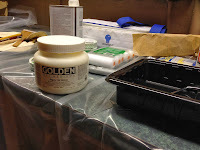 For more details on the process of gallery wrapped paper, see Ona Kingdon's posts on her process. UPDATE: Ona mentions two options for folding the corners. I've found the corners are too bulky if you do not cut the corners. Ona did not provide an image of how to cut them. Here is an image of how I cut the corners. First I remove the large triangular piece. 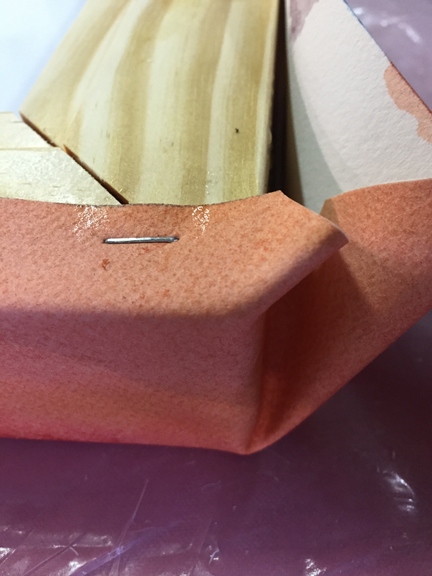 If you were to fold the paper down the paper would extend about 1" from the corner of the stretcher bar corner. The small triangle is then removed so the point of that triangle is about 1" from the stretcher bar corner. 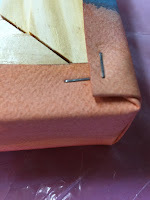 I fold one side so it is very tight against the stretcher bar and staple near the corner. Press and crease so the paper is snug all the way across from top to bottom of the corner and test that when the paper extending to the right is folder up (in the next step) that it will be parallel with the corner. I try to place the staple so it spans the corner with one leg in each piece of wood. The last step is to fold the right side up and staple it to the back. Again be sure the edge is parallel to the corner. You don't want it to extend out past the corner of the stretcher bar. I normally flip the painting over to dry and because I live in a humid area I have a fan blowing across the surface for a full day to help the paper dry and tighten. One final addendum: One of my paintings that I had gallery wrapped and varnished went through the May 27, 2018 flood in Ellicott City. The bottom two inches of the painting were submerged briefly when the wave his the painting. Mud and debris was left on the painting when the water level fell back down. When I got the painting back I was able to easily wipe the mud and debris off the surface to see the painting surface was unaffected. 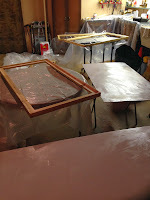 The stretcher bars had gotten wet and I felt they could become a problem over time, since they are made of wood. I removed the mounted painting from the stretcher bars. Verified the painting was still well adhered to the Alumalite board and then framed it in a lovely Silver Wood Frame. A great testimonial to how well this mounting and varnishing process protects the painting from the environment. Copyright April M Rimpo 2015 All Rights Reserved. You may share my work with attribution and a link to this source site, but all other uses are prohibited. 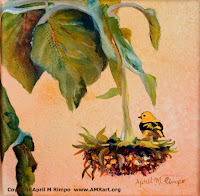 Most of my paintings are much larger than 6" X 6", but recently I felt like painting while staffing the gallery. You can see I used mostly small brushes on this one. Koi Pond was done on Aquabord which bubbles when you first apply water and wet paint to the surface, so the larger brushes you can see were used for that first layer or two when there was more water than paint and the goal was to eliminate the bubbles before I got too much pigment on the painting. I used fluid acrylic but used many layers to build up the depth of color, just as you do with watercolor. This approach results in great variations in the greens of the lily pads and blues of the water. The same is true for the koi. In order to get a rich red or orange you need to start with a layer of yellow and then apply red over it once the yellow is dry. If you just use a red to begin with you won't have the same vibrance. I think this small painting has strong enough color to support a wider frame than I generally use on painting of this size. If you want to see it in person, I'll have Koi Pond at my solo exhibit at Ranazul tapas wine bistro in November. You'll find Ranazul at 8171 Maple Lawn Blvd, Fulton, MD 20759. A reception with tapas will be held on November 8th from 4 - 5 PM. 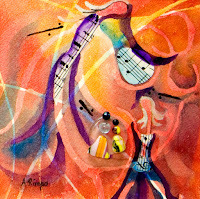 Purchase giclee prints on watercolor paper in my Spreesy Shop. I never start a painting without a plan, until now. No intended color scheme, just a drawing of the rooster? Well it happened. Let me know what you think of the result. 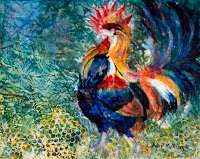 I had sketched the Bantam rooster on an 11"X11" piece of watercolor paper in preparation of demos during Art Walk, but didn't get to it that day. So I sat down in my studio knowing rooster and size of the painting. 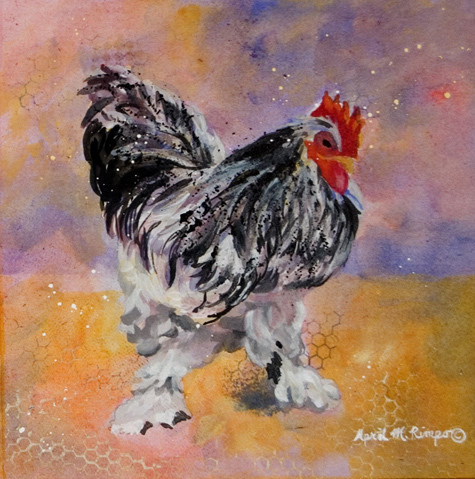 Since this type of rooster is black and white, I wanted a bold background. I thought, well his comb and wattle are red, as is the eye ring and ear lobe, so I want red in some areas of the background. I selected one of the textures I like and was about to put down some red when I thought I should used some yellow first. Red always pops a bit more with yellow behind. Yellow and red were added to the paper in geometric shapes. 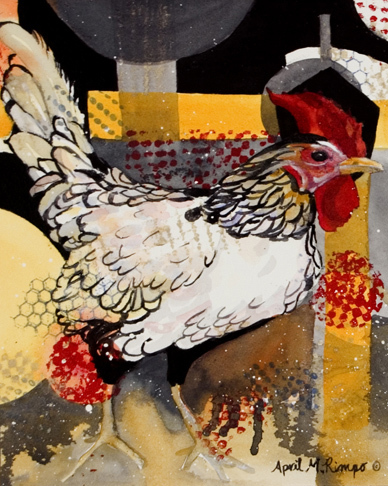 I extended the yellow behind where the roosters comb and wattle would be located and ended up with an L-shape of yellow. It seemed right to start with the wattle, comb, and eye so I did those before I finished developing the background. They helped to establish the focal point and give me something to compare when deciding on the darkness of colors used elsewhere. Next I thought I should add some black and gray to the background to help make the bright colors pop. I selected areas where I thought the black would accentuate lighter areas of the rooster and applied those first. Gray was used to surround some of the black, establishing middle value to dark areas that would not distract you from looking at the rooster. The patterns of color in the background started to look like deco so I ended up adding more to accentuate that appearance. Next I added some light washes on the rooster's body, to give some shape. 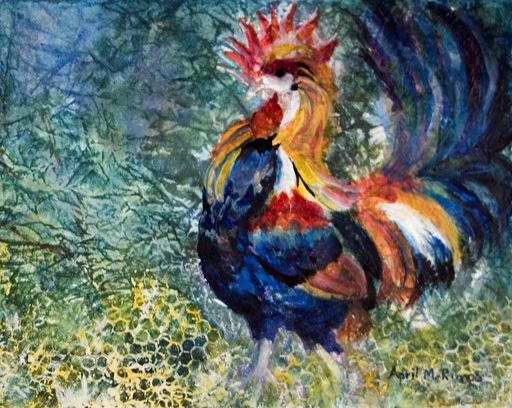 Once dry, I added just enough dark edges to the feathers to identify the rooster as a Bantam without fussing about every feather. I wanted him to pop out of the page. 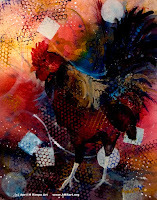 I felt that too many detailed feathers would just add confusion over where to look - the feathers or the rooster's head. You may have noticed I started with an 11"X11" sheet of paper thinking this would be a 10"X10" painting when done. Even that changed! In the end I decided to mount the painting on an 8X10" deep cradled panel, which looks great. I enjoyed responding to one section of the painting to decide what to do next, but doing this on one of my larger paintings would have probably left me struggling with indecision. 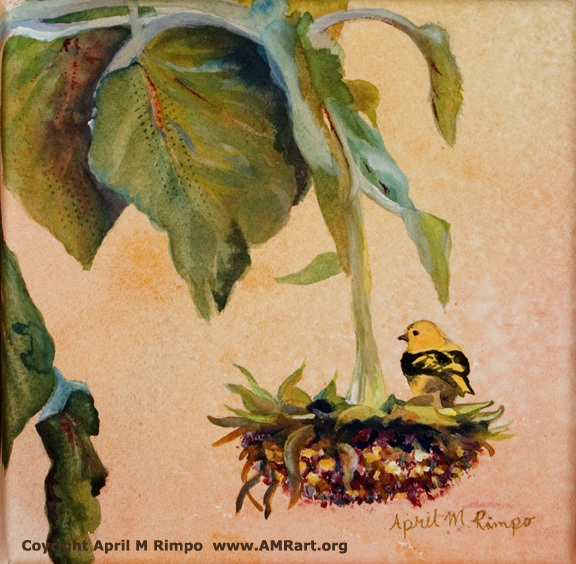 * Shipping cost included within the United States for the original painting and the giclee print. Having completed a day of conducting demos of "Patterns in your Paintings" to the public, it seemed like a good idea to share what I learned. This is the first time I've taught in a public space. I was setup in Still Life Gallery during Ellicott City Arts Coalition's Art Walk. I had eight completed paintings on display, some that included patterns and some that did not. It was important to stress that if patterns won't enhance a painting, then don't use them. So I was ready.... but worried about what people might ask and whether I would really be ready. Well I'm happy to report it went really well. It took me a while to get comfortable striking up a conversation as people came through the gallery. But they were friendly and asked great questions. Some were fascinated with the sense of depth in my paintings and enjoyed discovering the patterns hidden within some of them. My favorite exchange was with a little girl who offered color choices for the painting I was working on. She was delightful to talk to and had really great ideas of what colors work together. I couldn't disagree with any of her suggestions. She went on her way with her parents before the painting was complete, but I think she would be pleased with the result. Her father whispered to me that she has already told him she plans to be an artist and I told him she had a good sense of color. 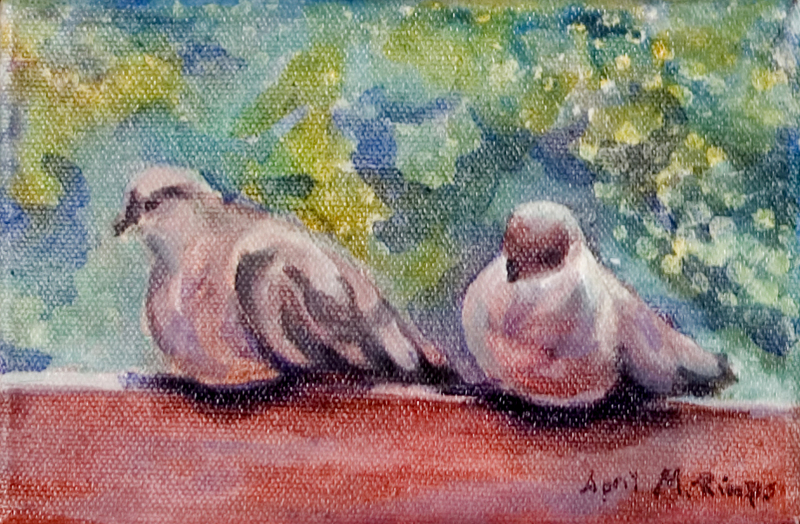 See Morning Doves which includes her color choices. 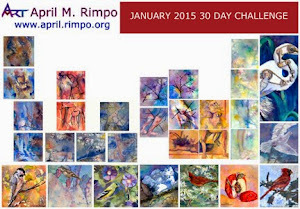 "Copyright April M Rimpo 2015 All Rights Reserved. You may share my work with attribution and a link to this source site, but all other uses are prohibited." I've found incorporating patterns into my paintings has added a lot of interest and depth to the artwork. As with all techniques I only use patterns when I think they will enhance the emotion I want to convey. Often I find patterns lend themselves to fun and happy paintings. Here is a variety of paintings where I used patterns. Fashion also uses stamps and geometric shapes but in more muted colors that push them to the background. They become secondary to the figure but are fun to explore once you notice them.